Lena Goodson performed on Show 290, recorded May 2014, at age 16. 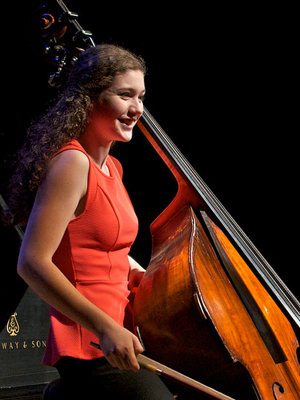 Lena Goodson (double bass), 16, is from York, Pennsylvania, where she attends Central York High School and studies with Devin Howell. She participates in the Peabody Youth Orchestra, York Youth Symphony and the York Symphony Orchestra. In 2012, she attended the Interlochen Summer Music Camp, where she was a member of the World Youth Symphony Orchestra and won the 2012 Concerto Competition. Also in 2012, Lena placed first in the York Youth Symphony Orchestra Concerto Competition. Outside of music, Lena likes hiking, walking her dog, and writing.